Giant Trophy Southeast Alaska Steelhead Taken by Fly Fishing! Todd Petersen found himself one lucky angler in 2002 when he caught and released this exceptional Southeastern Alaska steelhead in a remote rainforest stream. The fish measured 39 1/2 inches and based on the typical methods of calculating live fish weights it would have pushed the scales well into the mid-20 pound category. This one will make the Alaska Outdoor Journal Hall of Fame as a qualifying catch even though it was not killed and officially weighed on a scale. 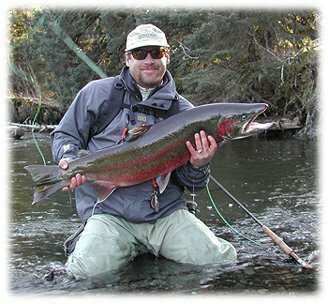 Its size and dimensions leave no doubt about meeting the minimum 20 pound qualifying weight for Alaskan Steelhead.